What is Copyright in Photography and Art? The purpose of this article is to explain the basics of copyright and how this relates to contests on Pxleyes. The legal definitions of copyright laws both in the United States and Internationally are similar and these definitions can be found on the Internet if you wish to read the specific legality in your country. All references to copyright in this article are in relation to photographic images and artwork specifically although copyright law extends to other areas as well. Copyright is a legal concept, enacted by most governments, giving the creator of an original work exclusive rights to it, usually for a limited time. Generally, it is “the right to copy”, but also gives the copyright holder the right to be credited for the work, to determine who may adapt the work to other forms, who may perform the work, who may financially benefit from it, and other related rights. Copyright is the legal protection offered by Governments to give control to an individual or corporation as the originator of a photograph or artwork. This control is exclusive and allows the copyright holder to publish, copy, distribute and assign usage and availability of their image. How do I know an image is copyrighted? The following symbols indicate ownership of an image: © Copyright, ® Registered Trademark and TM Trademark. 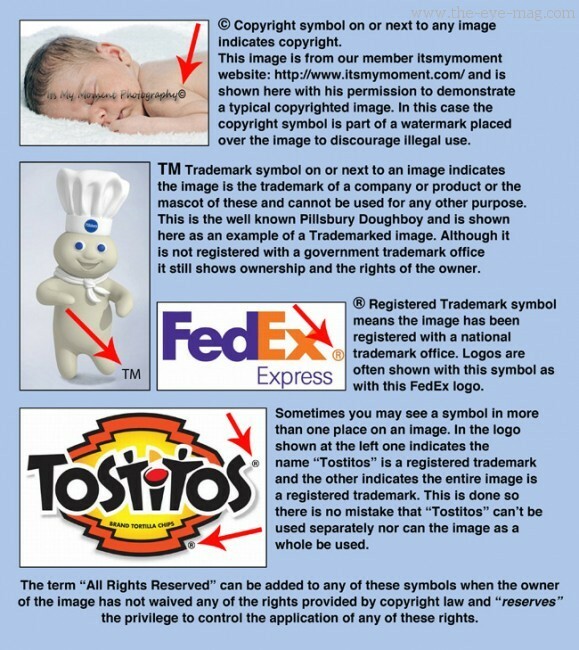 Sometimes you will see one of these symbols with the words “All Rights Reserved”, the strictest example of ownership is “Registered Trademark, All Rights Reserved”. What if I don’t see any symbols or explanation with an image? This is often the case with images found on the Internet when you search on blogs or “Google” for images. You must assume that someone owns these images, seeing them on websites is no indication that they are free to use. This term is part of most laws of copyright and in the case of visual images relates to the intangible, conceptual aspects of an image and is not always a clear definition and often must be judged on the individual case. In general you can’t copy the unique elements used in a composition nor the unique design aspects of the work and claim them as your own. There are times when a concept is simple and common and we’ve seen entries that are very similar to other works in the same contest or even seen somewhere else. When the theme is basic such as “Show an animal flying when in reality it doesn’t” we will certainly see similar entries like pigs or cows flying. That isn’t unusual and is expected. Why is copyright important in a contest? As a responsible member of the Internet community we are obligated to respect the efforts of artists and authors who contribute images for our enjoyment and edification. We adhere to their wishes regarding the use of images they provide and we expect everyone to do the same. When an image is copyrighted and used in a photo manipulation you have violated the rights of the author. There is also the aspect of originality to consider, as authors and artists your concepts and work should be your own. To copy an image and present that image as your own work is deceptively false. To present a photograph as your own in a contest when you did not create it is blatantly wrong. If it were your image that was misused you would be offended by such a transgression and rightly so. What is “Fair Use” and “Parody Tribute”? “Fair Use” is an exception to the exclusive rights granted by most copyright laws. This permits the limited use of copyrighted material for commentary, criticism, news reporting, research, teaching and educational purposes. “Parody Tribute” is the use of a copyrighted image (usually a character) that has been recreated with the intention to compliment or pay tribute to the original image. Because these exceptions must be evaluated their acceptability is determined by Pxleyes and in general are only permitted in contests that permit the use of copyrighted material. How can I avoid using copyrighted sources? What about Public Domain Images? Images in the Public Domain have no copyright or ownership issues. These images are free to use and can be found by searching “Public Domain” on the Internet. Wikipedia has many of these images as well as images under Creative Commons License. 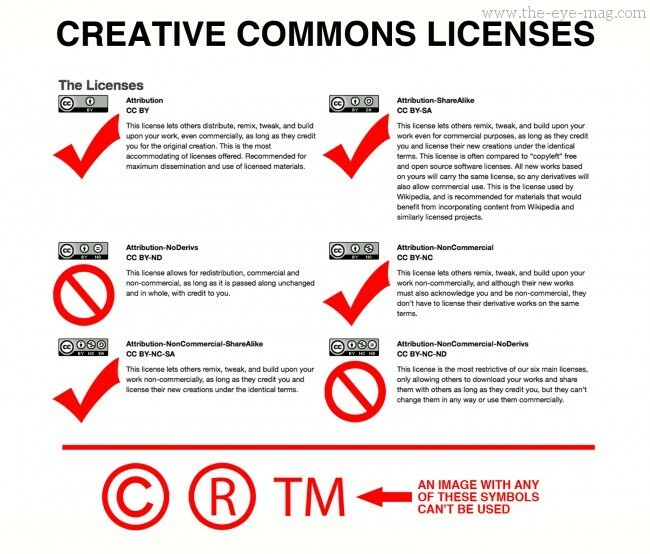 What about Creative Commons Licenses? How do I get copyrights on my photographs? The instructor of my last college photo class told me, the second I take a photo, it is legally mine. Though once I had a model/friend steal 6 rolls of the film I shot of her. I later seen a few of my shots she had blown up & framed. Beautiful b/w portraits. What could I have done? After a 10yr friendship, it was over, the photos were more valuable than our friendship. I lost a friend & from what I’ve seen, a beautiful display of my work. I won’t ever let this happen again. But I am reluctant to display my photos on the internet without copyright. Thank you.